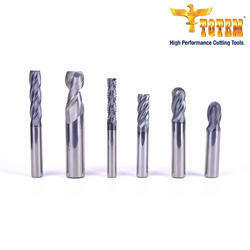 We are a leading Manufacturer of solid carbide end mills from Mumbai, India. Since our commencement, our firm is engaged in introducing a premium quality array of High-Performance Solid Carbide End Mills. These mills are manufactured under the various guidelines of industry standards. After production, the offered mills are quality tested on the various scale such as tensile strength, largeness, lengths, thickness, and joints. Also, clients can provide the custom specification for the mills. In addition, the mills are manufactured using approved steel alloy.